Republic of Srpska has, based on Employment Office records, 116 274 job seekers as of October 2017. According to these data, unemployment is significant. Someone could say there is not enough jobs in Srpska, since these people can’t find one. Even Employment Office, in such deficit of jobs, published advertisements for employing our people in Slovenia, Slovenian Post Office for example, or various private owned businesses. Apparently, they have deficit of workers, and we have plenty. When you talk to domestic enterprises and people from these enterprises, you’ll hear they have serious problems finding not only skilled workforce, but more and more any workforce. Also, projects organizing trainings for acquisition of skills for work in industry have problems with low number of unemployed people applying to these trainings. So, something here isn’t right. There are many unknown elements in this equation, but now I want to concentrate on one of them, which is of technical nature. Number of listed unemployed persons, or active job seekers, does not corelate to real situation. 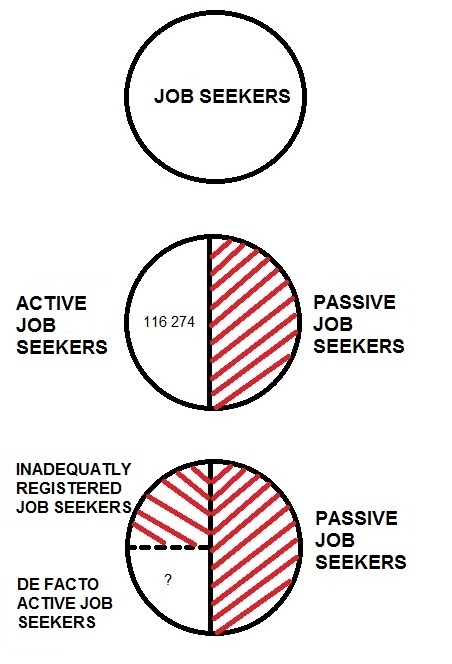 Namely, job seekers are divided into two groups: passive and active. Passive job seekers (an oxymoron) are not seeking for a job. They are registered in the Employment Office records because of exercising their constitutional rights on health insurance. Even though they are called “job seekers”, they are not job seekers. Everybody is aware of that and they do not participate in this number of 116 274 job seekers. Active job seekers should be really seeking for the job. They are, from time to time, contacted by Employment Office for job interviews in enterprises. They do make the number of 116 274 job seekers. Problem with reliability of the job seekers list exists because of the way job seekers are classified in active or passive group – they declare themselves as passive or active. Part of those people, de facto passive job seekers, are declaring themselves as active ones in fear they will be deleted from the list and loose their constitutional right on free health insurance. While talking to employees of Employment Office, you can hear that number of active job seekers varies depending on statements of high-ranking RS Government officials regarding deleting passive job seekers from the list. During the job interviews, these persons say to potential employer that they participate only pro forma. I’m not sure is it possible to determine approximate number of such cases, but I’m afraid they make too large percentage of the active job seekers. This could, partly, explain wrong perception of Republic of Srpska as area with surplus of unemployed people. In any case, secondary data should be defined the way that they make easier, instead of they make more difficult proper treatment of the problem they are related to.